Several 8th Ward residents held a Press Conference in front of Ald. Michelle Harris’ ward office to protest a proposed Low Income, Section 8 housing project to be built at 9329 to 9429 S. Stony Island Ave. The building will consist of 134 units, 7 Story. 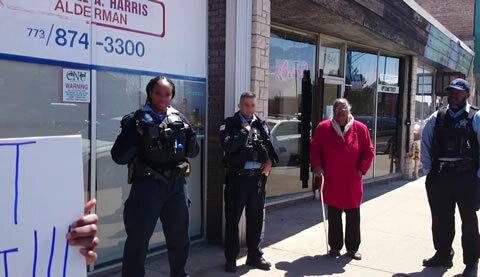 When protesters arrived for the Press Conference in front of the alderman’s ward office at 8539 S. Cottage Grove Ave., there were 6 Police SUV Squad Cars already stationed on the street in various places, and a few police officers standing on the sidewalk with protesters to watch what was going on. The Program Will Air Five Times on Channel 19 and Channel 21. At the Press Conference several 8th Ward residents voiced anger, frustration and concern that Alderman Michelle Harris was backing the proposed low Income, Section 8 Housing Project which takes in Pill Hill and Calumet Heights, an affluent black middle and upper middle class neighborhood. 8th Ward residents are appalled over the proposed “Trojan Horse” Project, which will be constructed at 9329 to 9429 S. Stony Island Ave. Both Channel 19 and Channel 21 will air the Press Conference, held in front of 8th Ward Alderman Michelle Harris’ ward office on April 25, 2018. Several 8th Ward residents showed up for the Press Conference and some of the speakers vented their anger and opposition to the proposed low income Section 8 building. The building will consist of 134 units, 7 Story. CAN TV will air the program five times in two days. Mark your calendar and don’t forget to watch and see what community residents have to say about this “Trojan Horse”, low income idea.